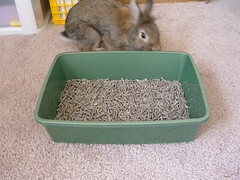 Cocoa now has a new litterbox! I decided his corner one was too small, and went to Walmart and bought a small cat litterbox for just $2! It's the perfect size too. Now all of the hay from his hay rack falls into the box rather than all over the cage. And all of Cocoa's...um...droppings....stay in one place too! He seems to enjoy it better and it seems more comfortable for him. Cocoa's checking it out before I put it in his cage! we have the same litterbox, it's the perfect size !